Little Venice is home to quirky waterside cafes, cosy pubs, and charming restaurants and boasts some of the most interesting independant theatre venues in London . Regent’s Park combines large open spaces with tree-lined pathways, formal gardens. London Zoo is the world's oldest scientific zoo. Today it houses a collection of 698 species of animals, with 20,166 individuals, making it one of the largest collections in the United Kingdom. Nearby tube stations give you access to any part of London, with all the attractions that this great historic city has to offer. 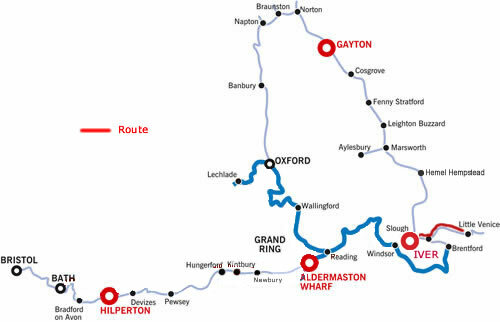 This lock free route only takes 2 days cruising allowing you plenty of time for sightseeing and using the boat as your accommodation base in the heart of London! Along the Regents Canal moorings are provided at Kingsland, Battlebridge and Cumberland Basins all by prior arrangement, and at St.Pancras, east of Islington Tunnel, Little Venice, Bulls Bridge, Cowley Lock, Limehouse, and Brentford Gauging Lock. For Tourist information about London go to the visit london link (below under useful links). From your mooring cruise to the end of the Slough arm of the Grand Union Canal, at Cowley Peach Junction, and turn right towards Little Venice. The Slough Arm was almost the last canal to be built in Britain, in 1882, and on the way to Cowley Peach Junction you pass over 3 small aqueducts as you pass over the picturesque Cowley lake. The main traffic on the Canal is the late 1800's was bricks made from the local clay. Turning right at Cowley Peachey Junction towards Little Venice and Brentford you pass Yiewsley, West Drayton and Hayes Town, before turning left at Bulls Junction along the Paddington Arm to Little Venice, the main canal goes to Brentford and the River Thames. At this junction there was a large British Waterways yard which is now a 24 hr Tesco Supermarket if you need to stock up on supplies. At Uxbridge Road bridge 20 you can stop for the night as you will have cruised for 2 hours. The Hamborough Tavern is canalside . Continue along the Paddington Arm of the Grand Union Canal . Horsenden Hill and Perivale Wood provide a long stretch of beautiful hilly parkland along with Greenford Golf Course which adjoins the Canal. Between bridges 11 and 12 there is a useful Sainsburys supermarket right by the canal with moorings, and again by Kensal Green Bridge, just to the west. When you reach Little Venice the Paddington basin is straight on, but you will be swinging left. However if you wish to get into the West End, Covent Garden, or any part of London, Paddington underground (Tube) station is very close and allows you to catch the Tube to all parts of the City. These days if you have a card with touch facility,you don't have to buy a ticket for trains or buses in London, you just touch your card at the beginning and end of your journey and your card will be automatically charged. There are extensive moorings stretching west at Little Venice, also a pump out, toilets and full boater facilities. Groceries are available nearby. Little Venice is an oasis of tranquility. It's thought to have been so-named by the poet, Robert Browning. It is home to many boats, including a floating art gallery, puppet theatre and café. Lovely picnic spots include the Rembrandt Gardens. Grab your picnic hamper and enjoy the sunshine surrounded by flowers. Moorhens, Coots, Tufted Ducks, Pochard, Greylag and Egyptian Geese are all common sights on the canal and the local wildlife is never more alive than in the summer months. It is 3.5 hours cruising to here from Uxbridge Road bridge. Time to get out and explore! 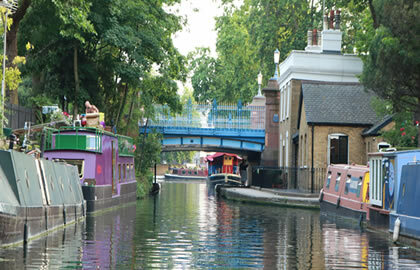 The Regent’s Canal is one of London’s best-kept secrets - a peaceful haven often hidden by the surrounding buildings. Locks are padlocked, you will need a Watermate key. Cruise along the Regents Canal which is tree lined with glorious Regency houses until you reach the Maida Vale Tunnel , check for oncoming boats through the tunnel, as there is only room for one boat . After the tunnel you can moor by Park Road Bridge 7 . Regents Park to your right is soon reached. Regents Park was originally part of Henry V111's great hunting forest in the 16th C.
The Park is surronded by very impressive Regency terraces & Gateways. Park Road bridge 7 is the best access to Madame Tussauds & the Planetarium and the Sherlock Holmes Museum are along Park Road. Moor just after Lisson Grove bridge 2 and walk along the canal to Bridge 7. London Zoo is situated canalside, moor just after footbridge 12 for access to the Zoo near the Cumberland Basin. London Zoo is the world's oldest scientific zoo. It was opened in London on 27 April 1828 and was originally intended to be used as a collection for scientific study. In 1831 or 1832 the animals of the Tower of London menagerie were transferred to the zoo's collection. It was eventually opened to the public in 1847. Today it houses a collection of 698 species of animals, with 20,166 individuals, making it one of the largest collections in the United Kingdom. At the Cumberland Basin the canal swings away to your left , there is a large Morrisons Supermarket off to the left as you go over the railway. Camden Visitor moorings are between Regents Park road bridge 15 and Fitzroy bridge 16. Camden market is off to your left - Eclectic market with youthful vibe and stalls/shops selling fashion and accessories, music and more.